The RAD TinyBridge and RAD TinyBridge-4W are high performance, remote, self-learning Ethernet bridges. Their small size and low cost make them ideal for cost-sensitive bridging applications or as LAN extenders or segmenters over bit-stream type infrastructures. RAD TinyBridge and RAD TinyBridge-4W are high performance, remote, self-learning Ethernet bridges. Their small size and low cost make them ideal for cost-sensitive bridging applications or as LAN extenders or segmenters over bit-stream type infrastructures. RAD TinyBridge and RAD TinyBridge-4W are available with 10Base5 (AUI) or 10BaseT (UTP) interfaces. The 10BaseT interface can also operate in full duplex Ethernet topologies. Since the units can be powered by the AUI interface, no external power supply is required. 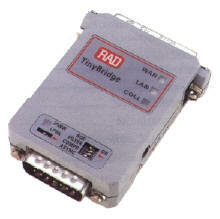 RAD TinyBridge offers a choice of WAN interfaces, including V.24, V.35, V.36, RS-530, X.21 or a built-in fiber optic modem. Optional enhanced TinyGram compression increases data throughput by stripping the padding bits in 64-byte frames. Any variable speed up to 10 Mbps on the link is supported transparently. The link speed may be adjusted “on-the-fly” without any effect on the RAD TinyBridge or RAD TinyBridge-4W. The RAD TinyBridge and RAD TinyBridge-4W are also available as interface modules inside a wide variety of RAD modems and E1/T1 access devices.